Cuscowilla on Lake Oconee is one of the top residential golf communities in Georgia, as well as a serene resort where guests can play a Bill Coore-Ben Crenshaw golf course. EATONTON, Ga. - How's this for a typical day during Masters week: You wake up in the middle of Georgia's beautiful lake country and have a hearty breakfast of French toast and a three-egg omelette. You jump in a helicopter that flies you to Augusta, where you watch Tiger Woods stride the fairways of Augusta National like the King of Egypt. Then, you climb back aboard the chopper for the return flight, away from the hordes of fans, where you get in a quick round of golf at what many consider the best residential golf course in America. Not bad, eh? This is what Cuscowilla on Lake Oconee offers. 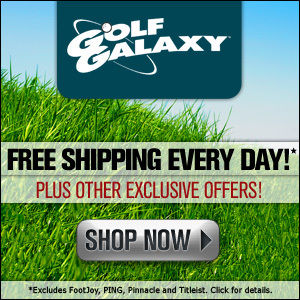 Or you can skip Tiger and the boys and just stay at Cuscowilla. Your choice. That's the sort of place Cuscowilla is, with its own helicopter pad and private pilot service. Cuscowilla is a residential golf community located on Georgia's second-largest lake, 19,000-acre Lake Oconee, but it's also a resort where guests can play the Golf Club at Cuscowilla, a course Golf Week ranked the best residential course in the U.S. in 2005. It is indeed a dandy, a beautifully designed layout that's a lovely walk in the park, amongst the indigenous flora and fauna, through the wild grasses blowing in the breeze, under tall pines and with plenty of glimpses of the big Lake Oconee. Course designers Bill Coore and Ben Crenshaw like to take wild pieces of land and sneak in their golf courses, almost as if they don't want them to be noticed. Cuscowilla, a few miles outside of Eatonton in a rural, northeast part of the state, is a serene slice of Georgia back-country, hilly and dotted with water and lake views. 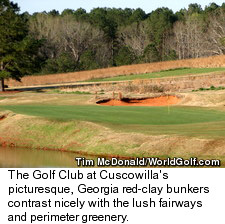 The picturesque, Georgia red-clay bunkers contrast nicely with the lush fairways and perimeter greenery. There are people who work at Cuscowilla, non-golfers, who like to ride around in carts and just look at the lovely landscape. 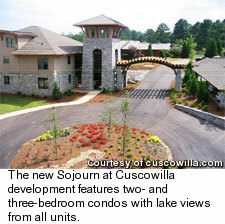 Coscowilla was established in 1997 on a site 80 miles from Atlanta that housed a former seed orchard. The property covers 700 acres with a variety of native, wild grasses like broom sedge. Homes are located in remote parts of the resort grounds, often behind automatic gates away from the developed side of the property, in an array of architectural styles - no cookie-cutter homes here. For resort guests, there are golf cottages between the second and 18th fairways, all individually furnished and including fully equipped kitchens, living and dining areas and one, two and three bedrooms. Each bedroom has separate bath facilities and full-sized porches overlooking the golf course, hardwood floors, yellow pine paneling and exposed beams. If you're a water person, there are lake villas as well as lodge villas - Mediterranean style with terra cotta roofs and Tuscan interiors. They range from studios with two queen-sized beds and a kitchenette to suites with full kitchens and living areas, located both on the lake and the golf course. Masters packages can be arranged by car, motor coach or helicopter and include meals and tee times at Cuscowilla. The resort has two restaurants. Waterside Restaurant, the more formal of the two, serves dishes like escargot, Hungarian crepes, Australian lamb, New England scallops and Italian crusted salmon. The Golf House Grill is the more casual of the two, in a clubhouse inspired by the architecture of Frank Lloyd Wright, with oak-barreled ceilings and veranda patios stretching around the 14th green. Non-golfing adults can have fun here, with canoes, kayaks, jet skis, tennis courts and walking trails, as well as massage therapy. Families also like to vacation here because of the Kids Club, located by the swimming pool in the Lake Village. It has a swing set, basketball court, ping pong, foosball tables and toys for small children. For the business set, there is a corporate retreat - four rooms that can be opened to create two larger rooms holding 120. Wireless Internet is available throughout and a variety of audio-visual equipment. A lot of people like to get married at Cuscowilla. The resort staff will arrange everything from bridal luncheons to rehearsal dinners to the reception. 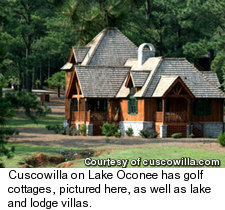 Cuscowilla is about 10 miles outside of Eatonton, home of Brer Rabbit, and a stop along the Antebellum Trail on Highway 441. Lots range from $100,000 to $1 million and homes from $350,000 to $3 million-plus. For more information, see www.cuscowilla.com. The Coves at Round Mountain in Colletsville, N.C.